Today i’m going to explain how to get these easy black and gold nails. I got inspired by a photo I found on the internet (which is the left photo), the photo on the right is my take on it. You will need: a base coat, a black nail polish, a gold nail polish, and a matte top coat. The first thing you want to do is clean your nails, make sure all previous nail polish is gone. After that you want to file your nails in the shape you want them. After that you can start with the actual painting of the nails. First you want to put on a base coat, I used a clear nail polish with vitamins to strengthen my nails. After that i put on 2 coats of black nail polish (you can use 1 coat if you use a thicker nail polish). Make sure you give your layers a little bit of drying time, or you can use a fast drying top coat. After your 2 (or 1) coat(s) of black nail polish, you want to use a mattifying top coat, because your black nail polish should look matte. Last is the gold nail polish, it can be put on as if it were a french manicure. And then you should let it dry. Be sure to not use a top coat, because then your black won’t be looking matte anymore. 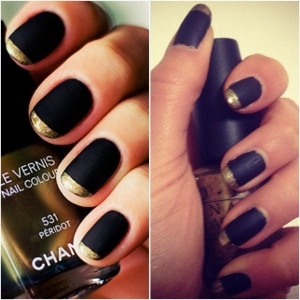 This entry was posted in beauty and tagged black and gold nails by missnathaliexo. Bookmark the permalink.